The shore excursion brochure listed this excursion as “Railway Trail Nature Hike.” This modest listing does not do the tour justice as there is more to it than that name indicates. While the Railway Trail was the centerpiece, we also visited historic landmarks, rode in a boat, saw some picturesque scenery and had a swim in the ocean. The Bermuda Railway (known as the "Old Rattle and Shake") operated from 1931 until 1948. It ran from Somerset in the west through Hamilton to St. George in the east. The right of way was 21.7 miles long and supported a single standard gauge track. The reason for building the railway was to provide internal transportation on the island. At the urging of distinguished visitors including U.S. President Woodrow Wilson and author Mark Twain motor vehicles were banned in Bermuda in order to preserve its unique atmosphere. However, this left only horses, bicycles and feet as the means for getting around. Therefore, in the early 1920s, the Bermuda government authorized a study on building a railway on the island. It predicted that such a railway could be built for a reasonable cost and that revenues from transporting tourists as well as freight traffic would return a healthy profit. After considering several proposals, the government authorized the formation of the Bermuda Railway Company. The railway was beset by problems from the beginning. Landowners did not want to sell their property at a reasonable rate so the company chose a coastal route in order to reduce land acquisition cost. However, this required building 35 trestles and bridges over the ocean. Not only were these costly to build but they were costly to maintain. In addition, the soft limestone that lies just beneath the surface in Bermuda proved hard to work with. Blasting only caused problems and so much of the right or way was carved out of the stone using chisels. It took some seven years to build this short railway. The railway never made money. Because of the decline in agricultural exports to the United States, there was very little freight traffic. That is until World War II, when the railway was used to move freight between the island's naval and air bases. This traffic caused more stress on the rails, bridges and trestles, which were not well-maintained. As a result, after the war, the railway needed extensive work. So much so that the Railway Company sold the railway back to the Bermuda government. The government considered rebuilding the railway but instead decided to lift the ban on motor vehicles and established a bus system. The railway rolling stock was sold and found a new life in what was then British Guiana. 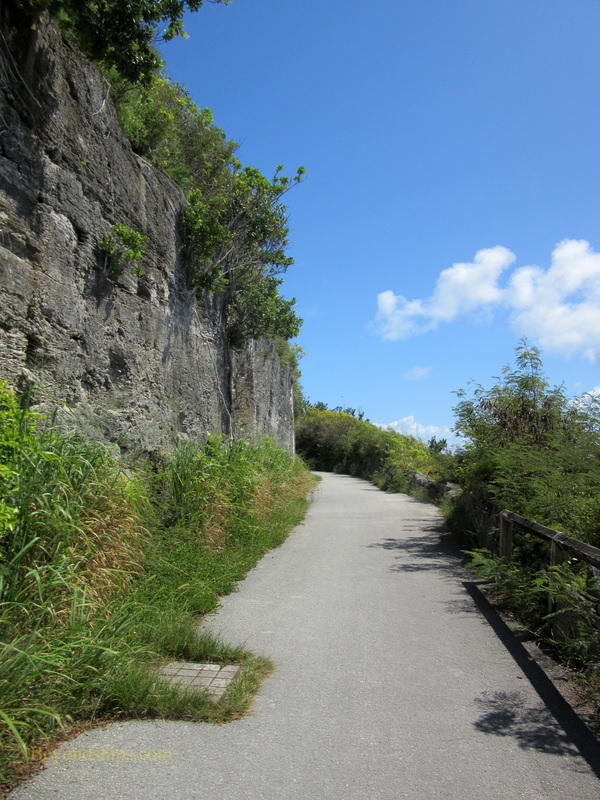 In 1984, what remained of the railway right of way was dedicated as the Bermuda Railway Trail. It is used for hiking, jogging and on the paved sections, bicycle riding. ​On this tour, we walked a relatively small portion of the trail near Somerset. The trail was paved and was surrounded for much of the way by dense vegetation. Occasionally, the vegetation would open and give way to scenic views of the Great Sound. On the other side of the trail, there were faces of limestone that had been sheered off by the builders of the railroad. Our guide explained how the builders had cut through the stone using hand tools. He also pointed out different plants and birds that we came across along the way. Not all of the walk was on the Railway Trail. Before entering the trail, we walked through the Heydon Estate, a private park that is open to the public. At the top of a hill was the Heydon Chapel, the smallest and oldest church on the island. The building was constructed by shipwrights and as a result the ceiling of the chapel resembles the interior of a wooden ship's hull only turned upside down. Later, we departed the Railway Trail to visit Fort Scaur, a 19th century British fort. The fort is well-maintained with beds of flowers inside its walls. From the battlements, there are panoramic views over the Great Sound and the West End. The shore excursion brochure listed this tour as strenuous. It did require walking on trails through dense wild vegetation both to get to the Railway Trail from the Heydon Chapel and to get to Fort Scaur. But the walk on this portion of the Railway Trail was just a walk on a flat, paved sidewalk. A factor that does make this walk more difficult is the Bermuda humidity. The temperature in Bermuda is normally rather temperate. However, especially in summer, there can be fierce humidity that makes it feel much hotter than the temperature would suggest. The tour thoughtfully provides complimentary bottles of water. In addition, participants can leave bags in a locked room at the walk's jumping off point. The jumping off point is the the now defunct Willow Bay Resort. The resort property is still maintained and part of it is rented by this tour company as a staging point for a number of its tours including a kayak tour and a bicycle tour in addition to the railroad hike. After the walk, the participants were given about a half hour to take a swim at the beach abutting the resort. It is a pretty beach. However, it is not in the same league as Bermuda's famous South Shore beaches. This beach has a stretch of white sand lapped by clear, warm water. The water is only a foot or so deep for about 30 yards. It then drops off gently to perhaps five feet. The water in this deeper area was much cooler and more refreshing. We traveled to the jumping off point by boat. It met us at the Royal Naval Dockyard just across the quay from where the cruise ship was docked. On the way to the jumping off point, we encountered two racing yachts practicing for the Americas Cup race that will be held in Bermuda in 2017. Shortly thereafter, we passed through a sea turtle sanctuary. Two of the crew members went to the bow to keep an eye out for sea turtles. As they carried out their search, the captain told us about sea turtles in Bermuda. Next, we came to a small island called Daniel's Head. This is the westernmost point in the Bermuda archipelago and one of the corners of the Bermuda Triangle. Accordingly, the captain discussed various theories explaining the disproportionate number of ship wrecks that have occurred in this area. Nearby was the wreck of HMS Vixon, which was intentionally sunk there in order to protect a reef. The bow of the ship juts out of the water. As we circled the wreck,the crew tossed food overboard. Quickly we were surrounded by a horde of fish in a frenzy to grab some of the morsels. On the return trip, the boat went under the Somerset Drawbridge. A Bermuda landmark, this is the world's smallest drawbridge - - only wide enough to allow the mast of a sailboat to pass through. We then sped along through the Sound in the mid-day sunshine. The crew offered complimentary water and soda. Rum swizzles were available at an extra charge. This tour delivered more than was promised. The personnel were friendly and there was a variety of activity.